In January 2008, the U.S. Fish and Wildlife Service (USFWS) adopted the revised regulations of section 10(j) of the Endangered Species Act (ESA). This new rule substantially supports justifications for killing reintroduced, endangered gray wolves to nominally protect herds of elk, deer, and other wild ungulates in the Northern Rockies. Prior section 10(j) regulations, adopted in 2005, allowed states and tribes to kill wolves if they caused “unacceptable impacts” on an ungulate herd or population. The involved agencies were required to document both a decline in ungulate numbers and wolf predation as the primary source of this loss. The revised ESA section 10(j) regulations, however, eliminate these requirements and instead hold as their major criteria only the failure of a wild ungulate population to meet management objectives and wolves as one of the major causes. The new rule greatly expands the definition of unacceptable impacts to include wolf effects on ungulate behavior, movements, nutrition, cow-calf ratios, and other characteristics beyond population size. State or tribal managers are authorized to kill wolves to accommodate “appropriate” ungulate management goals, even those developed to reduce or eliminate predators in areas with plentiful game animals. Moreover, the modified 10(j) regulations allow not just landowners and federally permitted agents but also any citizen to kill wolves caught attacking their livestock or domestic animals. All of these provisions were devised in tandem with the first USFWS wolf delisting rule, as stop-gap measures that promote the most effective form of wolf depletion – state agent killing – in case delisting of Northern Rockies wolves does not proceed. Implementation of state wildlife department proposals to reduce wolf numbers under the previous 10(j) regulations was thwarted by several factors: First, despite the presence of a recovering wolf population, most elk populations in Idaho, Montana, and Wyoming have not only increased to all-time highs but have exceeded current statewide objectives. Second, wolves are neither the sole predator nor the primary cause of any ungulate population decreases or negative trends in the Northern Rockies, as other factors, such as extreme weather, habitat quality and quantity, and hunter depletion, may also contribute to declines. The Fish and Wildlife Service asserts that the new 10(j) rule is necessary because the prior regulations required “unattainable” thresholds for wolf impacts before state agents could justify wolf killing. Even though a federal court found USFWS wolf recovery goals insufficient to foster genetic interchange and its subsequent delisting plan arbitrary, the agency nonetheless avers that wolf mortality encouraged by the revised 10(j) regulations will not impede recovery if each state maintains 20 breeding pairs and 200 wolves of the approximately 1,500 wolves presently in the region. Idaho Fish and Game Director Cal Groen believes that his agency can provide the scientific proof that wolves are significantly impacting elk in the Clearwater basin. If IDFG can also demonstrate how these elk are not meeting population objectives set by wildlife managers, USFWS could grant the state authority to kill all but the 200 wolves required throughout the state by the federal wolf recovery plan. Elected Idaho officials support these malevolent wolf-control plans and continue to push for ultimate, if not immediate, removal of Idaho wolves from the federal endangered species list. Representative Walt Minnick, Senator Jim Risch, and Governor Butch Otter are working to convince Interior Secretary Ken Salazar and the Obama administration that Idaho is prepared to manage wolves and that delisting should proceed. Otter has pledged to enlist the support of other Western states and produce a letter from their governors to the new administration explaining the wolf situation and urging delisting. IDFG is also encouraging Salazar to move forward with delisting on the premises that minimum wolf recovery has occurred and that approved state wolf management plans are sufficient to sustain wolves. The Idaho Department of Fish and Game has not yet formally and publicly documented its specific plans to deplete the Clearwater population of wolves. 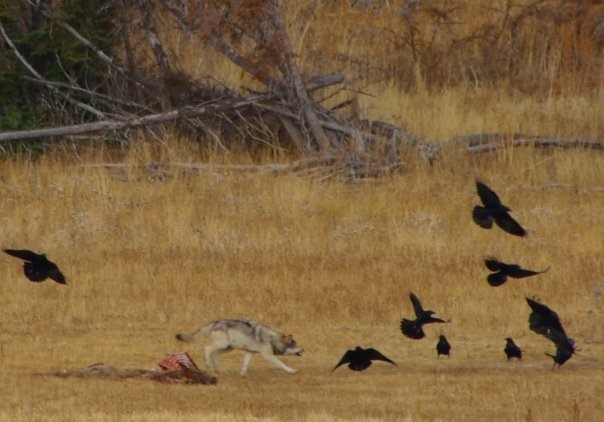 On December 18, 2008, Friends of the Clearwater (FOC) wrote to Steve Nadeau, the IDFG Large Carnivore Program Manager in Boise, requesting information related to wolf predation of elk in the Lolo zone. In accordance with the Idaho Public Records Act, we asked for various data from the Lolo and Selway management zones pertaining to cow elk losses, elk mortality last winter, and the range condition, trend, and carrying capacity of elk habitat. FOC also inquired about the methods that IDFG employs to determine its elk population objectives, the causes and predator species sources of elk death, and wolf population numbers and density. We additionally requested records of communication between IDFG and the Forest Service associated with witnessed helicopter landings in the Selway-Bitterroot Wilderness to presumably facilitate wolf census data collection. In response, on January 8, 2009, FOC received an IDFG letter that explained the calculation method used to estimate wolf densities and referred us to online documents, including their Wolf Management Directives as well as their Wolf Conservation and Management in Idaho Progress Report 2007, available at their website: http://fishandgame.idaho.gov/cms/wildlife/wolves/manage. On February 2, 2009, Friends of the Clearwater, along with other conservation groups represented by Earthjustice, reopened and requested a summary judgment of a lawsuit contesting the revised 10(j) rule. This case was suspended last summer after the same federal district court in Missoula ordered a preliminary injunction of the first wolf delisting plan. The plaintiffs hope to resolve the legality of this latest threat to wolves, especially with the possibility of dozens, if not hundreds, of IDFG-imposed wolf deaths looming over the Clearwater basin. We will continue to closely monitor IDFG’s plans and future USFWS delisting attempts, so that wolf packs in Clearwater wildlands and throughout the Northern Rockies can thrive and attain realistic recovery. We would also appreciate your efforts to persuade Interior Secretary Ken Salazar to retain endangered species status for regional wolves and to revoke the recent changes to the Endangered Species Act section 10(j) regulations. Please contact him by mail at: Department of the Interior, 1849 C Street NW, Washington DC 20240, or by phone at: 202-208-3100. Thanks, Jerry. I made a call. And got to talk to a real live person without any delay! I also mentioned Salazar’s self-serving comments in Newsweek about ranchers being stewards of the earth – though a tad off-topic.